A revenge-crazed killer holds a small town hostage after the accidental death of his son./Three men, gripped by the California Gold Rush, go mad when they become lost in the treacherous hills of the High Sierras. 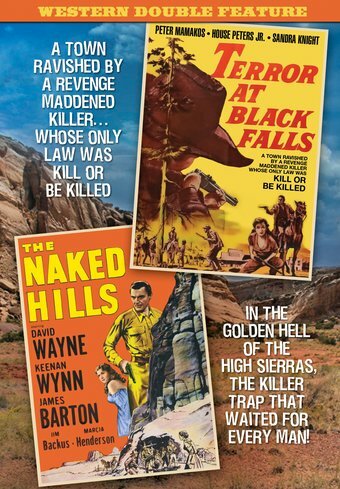 A shattering Western with a message of tolerance that offers no easy answers, Terror at Black Falls is the first film directed by Richard C. Sarafian. He later made the car-chase actioner Vanishing Point (1971). House Peters, Jr. followed his father into the movie business with dozens of parts in B-pictures and Westerns, and is known to a generation as the visual representation of Mr. Clean in scores of commercials. Sandra Knight was Jack Nicholson's first (and only) wife. She starred with him in The Terror (1963). Terror at Black Falls was filmed on location in Scotland...Arkansas! Many of the minor parts are played by nonprofessional actors who were residents of that small Arkansas town. The Naked Hills stars character actor David Wayne in a rare leading-man role. The Tony Award-winning Wayne is best known for Adam's Rib (1949), The Andromeda Strain (1973), and the role of the Mad Hatter on Batman (1966-1968). Jim Backus plays against type as a villain quite different than the characters he played on the hit sitcoms I Married Joan (1952-1955) and Gilligan's Island (1964-1967).